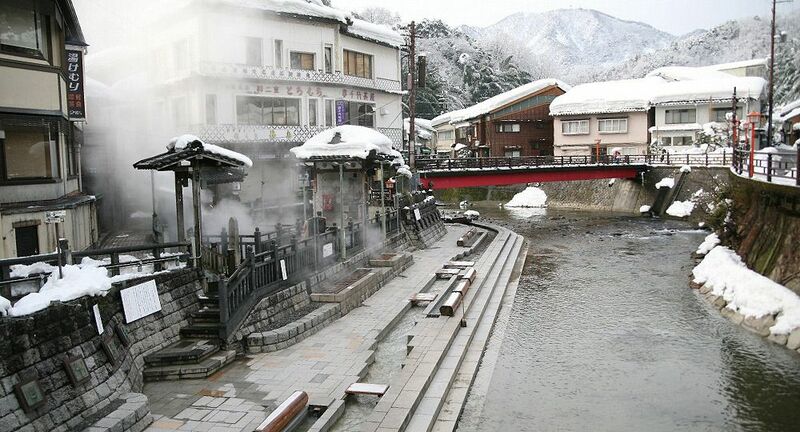 In Shin-onsen Town, Yumura Onsen, Shichikama Onsen, and Hamasaka Onsen flow forth. 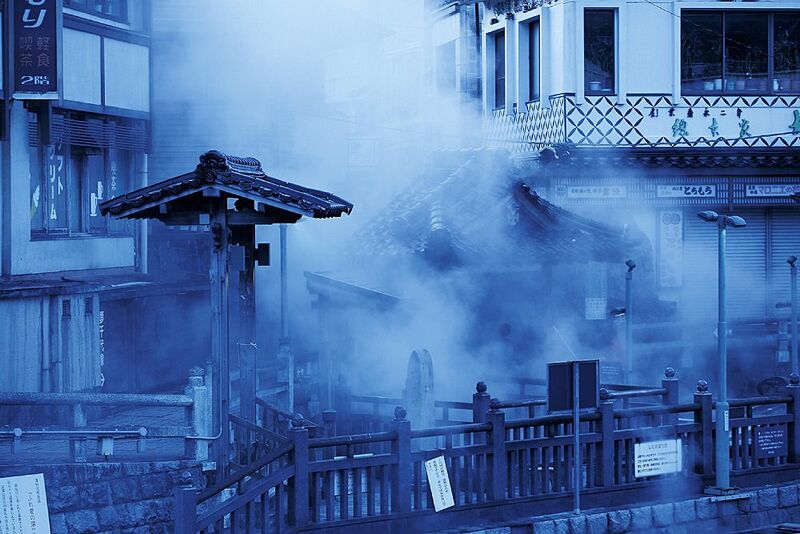 Shin-onsen is home to several hot springs (onsen) such as Yumura Onsen, Shichikama Onsen, and Hamasaka Onsen. The number of onsen in Shin-onsen is so great that the word "onsen" is used in the name of the town. Enjoy onsen which have the power to heal body and soul, while being surrounded by plentiful nature. 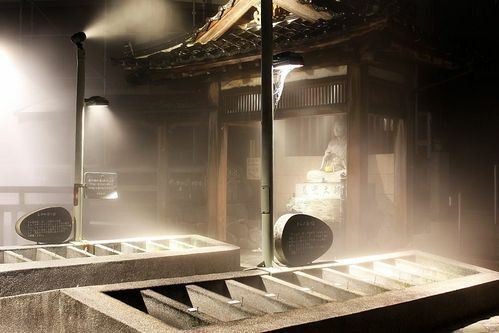 These onsens have a history from their origins in 848, especially Yumura Onsen. Featuring the particularly hot 98 degree water, the onsen comes from deep underground, where it is heated by the earth’s core and flows to the surface naturally. The hot spring water flows to Haruki Riiver 470 liters a minute and 2,300 liters to the whole town every minute. With over 1,150 years of history, this town has not changed from the past and still has abundant springs. The Arayu waters are at the heart of the town, both physically and symbolically. The onsen waters are available to everyone, so locals cooking and tourists relaxing in the waters are a daily scene. 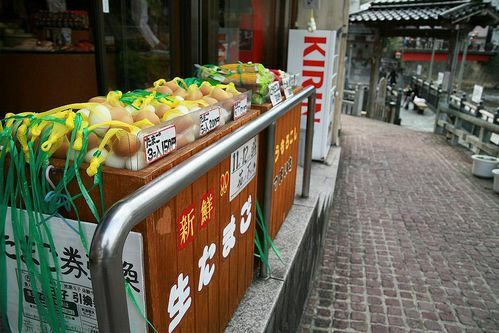 In the three yutsubo, vegetable blanching is a living part of the culture. Drinking the onsen water is also said to be effective for digestive disease, constipation, gout, and obesity. In the long history of the town, people have taken advantage of the hot spring waters in all aspects of life. The water flowing to each of the houses has made onsen a part of daily life. In addition, around Arayu, there are nature paths, the foot bath “Fureainoyu”, a statue dedicated to the Yumechiho Dairy drama, and a walkway of famous people’s handprints. 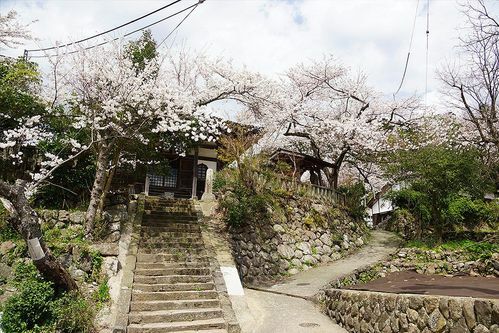 The seasonal scenery of sakura in spring, starry nights in summer, fall leaves in autumn, and snow in winter makes the town a perfect place to enjoy a stroll in the traditional Japanese yukata. With onsen in the ryokan and the public bath facilities, you can relax and enjoy the natural spring water. With a slight alkaline quality, the water is gentle on your skin and leaves your body feeling smooth. The water is good for getting rid of toxins and reviving your skin. Soaps and lotions are made with the same quality water as onsen. Yakushinyorai and Jikaku Daishi, the founders of Yumura onsen are enshrined here. It is said that it was built in 875. With the powers of healing, it is believed that he used the onsen waters for curing ailments. On the ceiling is artwork depicting the old Yumura "Yumura Hakkei." 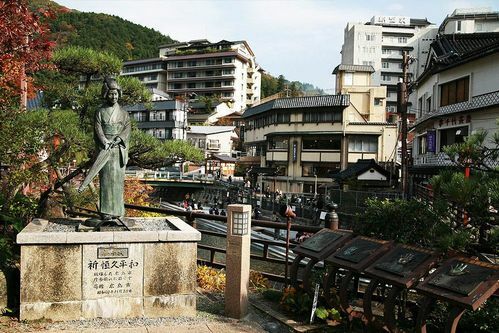 In the nearby area, a statue with a Haiku written by Matsuo Basho was built in 1832. If you leave an egg in the Arayu waters for around 13 minutes it becomes a boiled egg. The water’s mineral quality is great for cooking off the scum and dirt on vegetables. Since old times, the hot spring waters have been a place for people to gather together. In 1892, the Tajima Livestock Market was created and Tajima cows were shipped across the country. 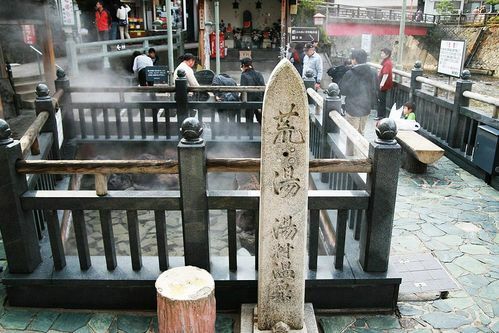 The onsen has been open to the public for a while and the locals have used the rich waters not only for bathing, but also for cooking and cleaning. Sake brewery’s are responsible for making traditional Japanese sake (rice wine), the Tajima Sake Brewery is one of the main three in Japan. The unique style of making sake at the Tajima Sake Brewery was born from the spirit of Tajima people and years of experience in crafting sake. 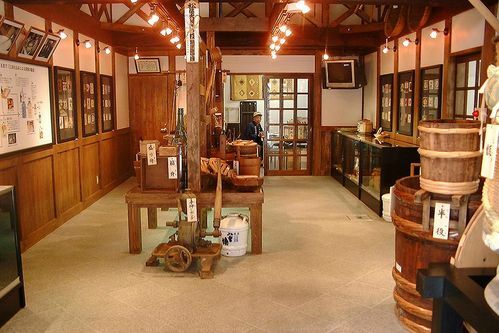 At the museum, you can see many documents related to the brewery and the tools used to make sake. Due to the large amounts of snow in Tajima, it's impossible to conduct farming in the winter. So the people of Tajima found their livelihood in making sake for the country. This onsen was discovered in 1955 in the middle of a rice field, and at that time a bathing area was established so you could simultaneously enjoy the atmosphere of the field while you bathed. Now, you can enjoy the Yuraku-kan, which features naturally supplied onsen and the "Shichikama" open air bath. 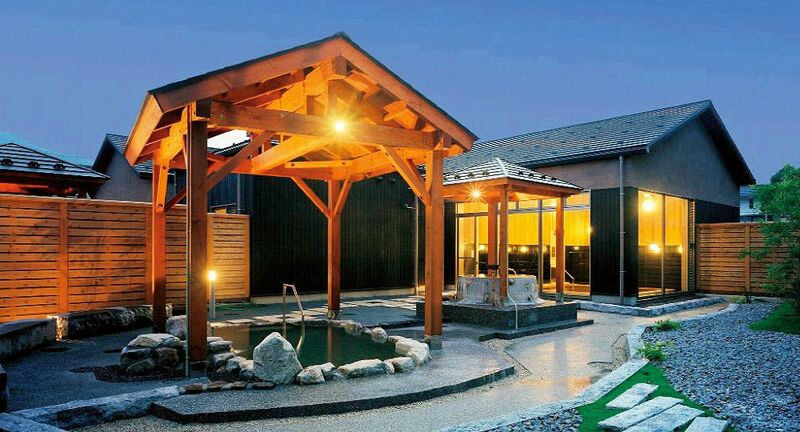 With many ryokan in the scenic countryside, you can easily find yourself in this popular onsen. With high quality water, you can warm up. No heater needed. 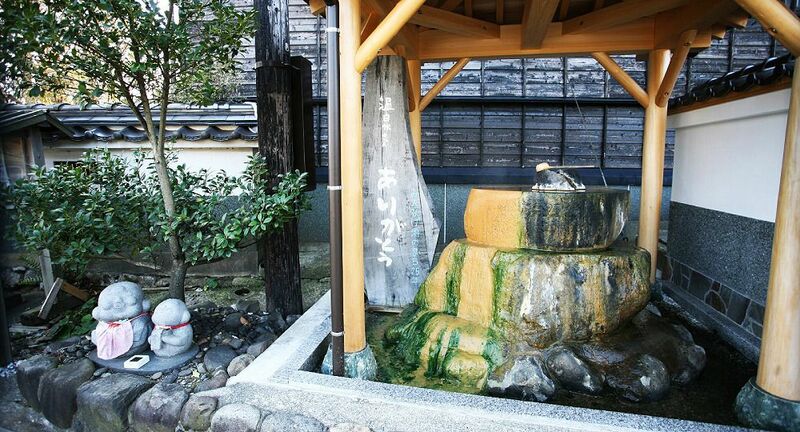 Discovered in 1978, the spring has been a source of water for about 750 houses before supplying the ryokan. With just a twist of the tap, people can enjoy the hot spring water in their own homes. Please enjoy a quick trip to the Utopia Hamasaka onsen and enjoy the view of the beautiful coast and pine trees.